← Videos: Let me get on the plane! At KLIA. SHAH ALAM: Container equipment operator Shahril Azlan Ahmad Kamil, 30, has won his civil claim against the police and government for shooting him at a roadblock. Justice Hanipah Farikullah held Friday that it was not right for a policeman to have shot Shahril when the officer’s life was not in danger. She ordered for general damages to be assessed later. Costs of RM30,000 was awarded. Shahril had alleged that he was shot by police officers on April 16, 2009, in Section 7 of Shah Alam while he was reversing his vehicle in a bid to evade a police roadblock. He was about 100m away, at a traffic light. He panicked upon seeing the roadblock and tried to escape as the road tax for his car has expired. Almost three years after container operator Shahril Azlan Ahmad Kamil was allegedly shot by police, and yet to receive satisfactory justification for this, the 28-year-old today initiated legal action against the force. The lawsuit filed in the Shah Alam Court Complex this morning names Shah Alam district police chief, inspector-general of police and the Malaysian government as defendants. Shahril states in his suit that the police had abused their power by shooting him with intent to kill, and without any just cause. He is seeking RM18,120 in special damages for the 15-month period he had underdone recuperation, and for repairs done to his vehicle that was damaged in the incident. Shahril is also asking for an unspecified amount in general damages and aggravated damages, with an eight percent interest rate from the date of the lawsuit. Speaking to journalists at the court lobby, Syuhaini said the explanation by the police that Shahril was a criminal was unfounded. “He has not been charged by the police for any criminal offence until now,” she said. SHAH ALAM: A man has lodged a police report that he was shot by police at a roadblock in Section 7 here at midnight on April 16 last year. Shahril Azlan Ahmad Kamil, 26, said he lodged the report because no action was taken after the first one was lodged by his father at the Klang police headquarters one day after the incident. The machine operator at North Port in Klang lodged the report at the Shah Alam police headquarters here yesterday. 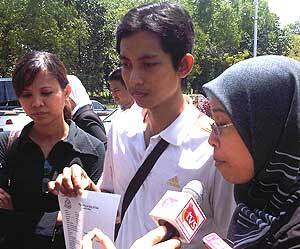 He wanted Bukit Aman police to form a special team to investigate the case with fairness and transparency. Accompanied by lawyers Fadiah Nadwa Fikri and Puspawati Rosman, he said the shooting left him with sleeping problems and numbness in the leg, making it difficult for long-distance driving. Recalling the incident, Shahril said he was driving home with a friend after watching a football game at a restaurant in Section 7 when he saw a police roadblock. He stopped at a traffic light about 100m from the roadblock and panicked on realising that his road tax had expired. “I wanted to reverse but my friend said two men in plainclothes armed with sticks were approaching. I reversed and then heard two or three shots,” said Shahril. “One of the shots shattered the windscreen and hit me in the shoulder, rib and back. He said he told them he panicked as his road tax had expired and pleaded for an ambulance but he was suspected of having drugs. This entry was posted in crime, malaysia, man shot by cops at road block wins suit, police, shahril kamil, shooting by police and tagged man shot at police road block wins suit against police, shahril azlan ahmad kamil. Bookmark the permalink.